Bin 41 Your Junction Wine Shop! The Junction is excited to have another community oriented business open in our business district – Bin 41! 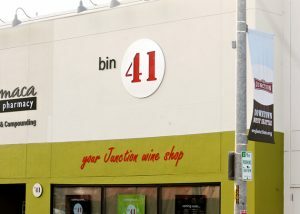 Owned by West Seattle residents, T. Frick and Jon McNamara, Bin 41 will be providing retail wine sales by the bottle and wine-related merchandise. With the new sign in place, they hope to open for business sometime in March, with their grand opening in early April. Look for Bin 41,”your Junction wine shop,” on the April West Seattle ArtWalk route!